Sudan shuts down Internet for a day amid deadly fuel riots. What’s Bashir’s strategy? 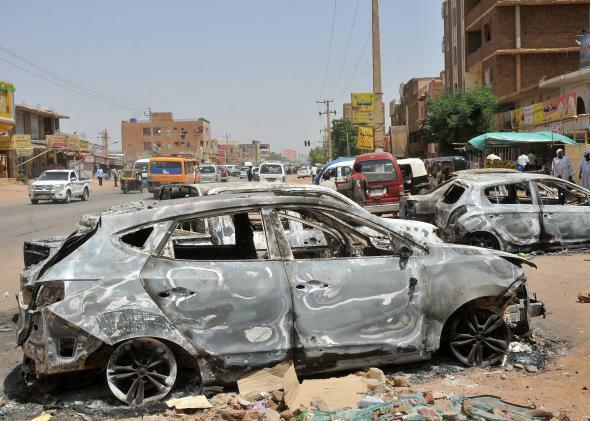 A picture taken on September 26, 2013 shows burnt vehicles in a street of the Sudanese capital Khartoum after rioting erupted following a decision of the government to scrap fuel subsidies. According to the firm’s analysis, the fact that different service providers in the country came down at different times “implies that this event was not caused by a single catastrophic technical failure, but strongly suggests a coordinated action to remove Sudan from the Internet.” Add to that, the fact that the outage occurred during the country’s worst protests in about two years, in which at least 24 have been killed. This move by the Sudanese government doesn’t make a whole lot of sense. The track record of dictators shutting down the Internet completely in response to mass protests—Hosni Mubarak in January, 2011, Muammar al-Qaddafi in March, 2011—doesn’t suggest it’s all that effective a way to crush protests. And it’s hard to see what shutting it down for just one day, amid protests that don’t seem to be abating, accomplishes other than attracting more international attention to the protests. Sudan political news doesn’t generally garner much attention abroad. Internet stories do. This is also surprising given that Omar al-Bashir’s government has actually been pretty savvy in its handling of online dissent in the past. The government has reportedly used fake Facebook pages to spread misinformation and collect information on activists as well as encouraging supporters to counter opposition groups online. This week’s approach seems comparatively crude. Add this to Bashir’s predictably futile and ultimately abandoned attempt to obtain a visa to visit the U.N. General Assembly in defiance of an International Criminal Court indictment, and this doesn’t really look like a regime in full control of the situation.